Gum recession occurs when the gums that surround your teeth begin to pull away, creating gaps, or pockets, between the teeth and the gum line. Without treatment, these pockets can collect harmful bacteria which can deteriorate the tissue and bone supporting your teeth. You may ultimately lose your teeth. You may notice that one or more teeth becomes sensitive when brushing, or that your teeth are beginning to look longer than normal. They are not growing; your gums are receding. You may even feel a groove or notch near the gumline as they recede farther. Your dentist can spot gum recession and may even take measurements for your charts indicating how much recession you already have as a baseline. Why Do Your Gums Recede? • Periodontal disease. Gingivitis and periodontal disease are the result of bacteria that gets between teeth and gums, generally as a result of poor home dental care. 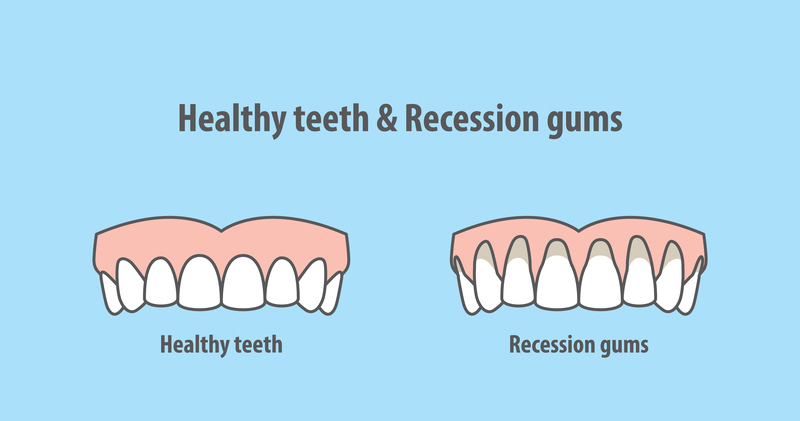 It is the main reason for gum recession. • Brushing too hard. Scrubbing at your teeth will wear away the enamel on your teeth causing gaps between the gumline and the teeth. It can also damage the gum tissue. Brush in a soft motion with the bristles at a 45-degree angle to the gums. • Genetics. If your parents or other family members have gum disease, you may be at risk also. Although this genetic disposition may be predestined, it is all the more reason to up your dental health protocol. • Lack of dental care. If you rarely visit your dentist for a professional cleaning and examination, and don’t perform regular and adequate brushing and flossing at home, plaque will build up on your tooth enamel. Plaque can only be removed by a professional cleaning. • Hormones. Women’s hormones can fluctuate at times of pregnancy, puberty and menopause. At these times, gums may be more sensitive and susceptible to infections and gum recession. • Malpositioned teeth. Teeth that are misaligned may place pressure on other teeth and cause gums to recede. • Teeth clenching and grinding. Clenching and grinding teeth are known to cause gums to recede. • Tobacco use. Tobacco leaves behind a sticky plaque that can cover teeth and be difficult to remove. • Piercings. Piercings of the tongue, lip or facial tissues can erode away or irritate gum tissue. The best way to keep your gums from receding is through great dental care. It’s as simple as that. Here are some of the ways you can maintain good dental health. • Visit your dentist at least twice a year for a professional cleaning and examination. • Watch for any changes in your mouth or gum tissue. • Wear a night guard. • Don’t chew on foreign (non-food) objects. At Advanced Family Dentistry, we work hard to make sure your teeth remain healthy throughout your entire lifetime. Through regular examinations and professional cleaning, preventive and restorative care, and by providing education on how to care for your teeth and those of your family, we offer the full gamut of dental care. If you’re in the Northern Virginia area, please contact us to make your next appointment.